Patio Paradise Faux Ivy Privacy Fence. Our fence is an artificial ivy leaf screen with realistic looking ivy leaves that help to provide that extra privacy while you are outdoor sun gazing or relaxing in your own backyard. The leaves the made with realistic face-resistant polyester that help to add a subtle but natural decorative accent to your property. It is light and very simple to install on any wooden or metal fence . We are product direct manufacturer, so you know you're getting the best prices available best quality . 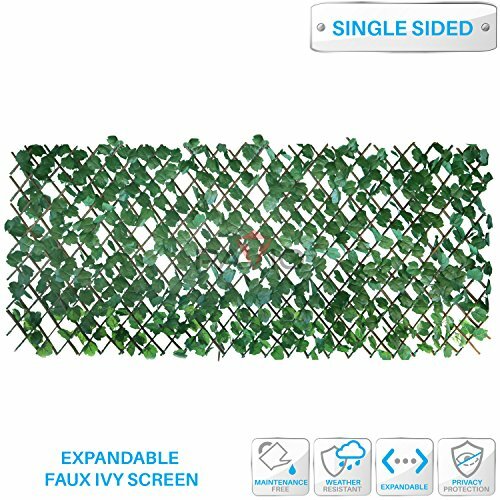 NEW PRODUCT WITH FACTORY PACKAGING Our fence is an artificial ivy leaf screen with realistic looking ivy leaves that help to provide that extra privacy while you are outdoor sun gazing or relaxing in your own backyard,frontyard courtyard. The leaves the made with realistic face-resistant polyester that help to add a subtle but natural decorative accent to your property. It is light and very simple to install on any wooden or metal fence or any wall. Perfect for anyone who needs that extra privacy on their balcony or backyard to feel a little bit more like home of a green natural world . Benefits of our product are very simple installation minimal tools needed, maintenance free, realistic fashion looking ,strong durable , UV treated, and no need to watering. With the natural look, you get the privacy you need. Easy to clean with water, des not need to water like real plants, does not require any maintenance. The leaves are attached to the panel strongly.These artificial leaf privacy décor panels come with a 1 year warranty for manufacturing and workmanship defects. It creates an intimate ambiance, it is not just a screen, it enhance you home, it is decoration! Dimension: 4' H x 1'7" L. After fully stretched: 2'8" H x 8' L. Flexible, expands or contracts to your desired dimensions and privacy. Made of natural real woods, easy and quick to install, It creates an intimate ambiance.